I am super, super, over the moon excited to introduce my newest pattern to you today. 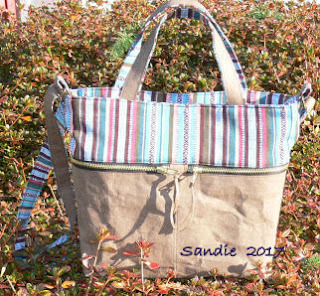 She's a super handy everyday bag with three zipper pockets (two on the outside, one in the lining), one slip pocket, magnetic snap closure, reinforced bottom for extra durability, as well as an adjustable strap. She's quite something, isn't she? I'm totally in love with those zipper pockets. I think they make for one very chic, as well as practical purse. Finished size of this purse is 11" wide x 10" tall x 3.5" deep. And, once again, I've enlisted help from some super talented ladies to test the pattern for me. I hope you enjoy seeing all the gorgeous Alice purses they made. This stunning beauty was made by Jamie. Such a fabulous fabric combo. Love, love, love. I'm a huge fan of Cotton and Steel fabric (especially these adorable striped cats) and I'm smitten with Jennie's beautiful Alice Purse. Sandie used Kraft Tex to make her Alice. What a great idea! I love the final look. Sonia made this beautiful sunny purse. So pretty! Love the large floral print Bev chose for her purse. It looks perfect in combination with linen and that striped lining. Just lovely! Last, but definitely not least is this beauty by Zen. Such a happy looking purse. Thank you, ladies for making such fabulous bags and all the useful feedback on how to make this pattern better and more user friendly. I greatly appreciate all your help. I hope you guys are as excited about this new pattern as I am. 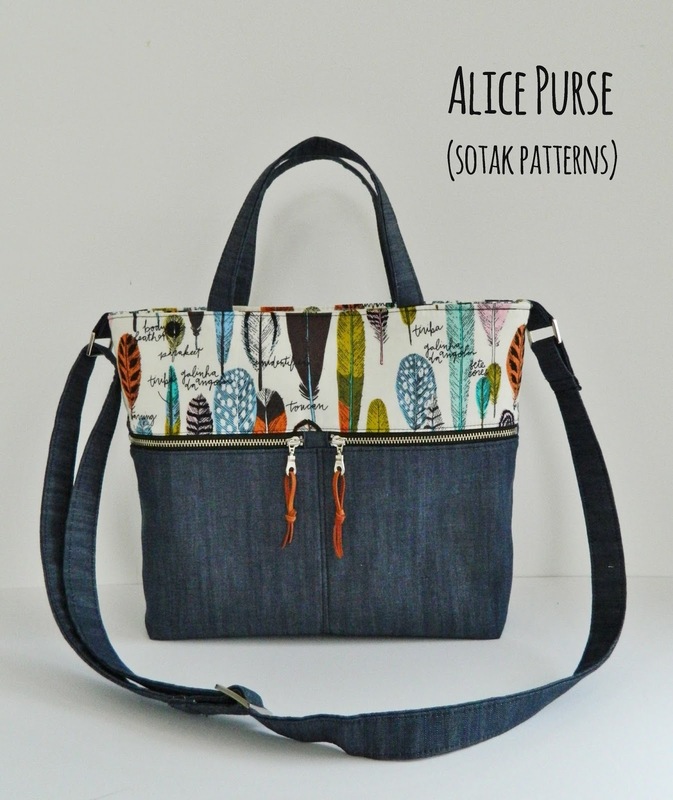 You can purchase Alice Purse pdf instant download pattern by clicking on the button below or by visiting my etsy shop here. And, for the next 48 hours, I'm offering this pattern at a discounted price of $6.00. As soon as I spotted this pillow on A Beautiful Mess website, I knew I wanted to make something very similar for our family room. I love seeing traditional blocks being used in slightly unexpected ways, and this rectangular nine patch pillow fit the bill perfectly. I combined Essex linen in flax and my screen printed linen in denim. I love the simplicity of this patchwork and thought a bit of hand quilting in sashiko thread would be a nice addition. I used yet another Essex linen from my stash for the backing and added an invisible zipper to make it a removable pillow cover. And then, since I didn't have embroidery thread to make tassels as called for in the tutorial, I made my own yarn tassels. I think they make the finished pillow look pretty cute, even my kids approve :). Finished pillow cover measures 12" x 24" and I bought the pillow form from Crate and Barrel. Clearly making just one qayg scrappy pouch was not enough :). So last night I whipped up this little pouch and pincushion set. Don't you just love how a few scraps of fabric and batting can be turned into such interesting panels in almost no time at all? Especially when you work on a small scale, like I did. I turned the two larger panels into a simple pouch, making the pattern up as I went. I used a 6" long metal zipper and adjusted all the measurements accordingly. And, since I didn't want to go with the usual rectangular pouch shape, I rounded the corners and cut out small darts to give it a bit more depth. Have you tried qayg before? I hope you give it a go, it's great fun. I have a free tutorial on how to make these panels here, and how to turn them into pouches here. Yesterday evening I suddenly decided I needed a new pouch for my pens. Truth is, of course I didn't need a new pouch. I have more than enough brand new pouches laying around my studio, but I was seriously itching to do a bit of scrappy qayg (quilt as you go) patchwork. I find qayg method to be very relaxing and meditative and in no time I had two pretty panels ready to be turned into a pouch. I decided to use my Lola pouch pattern, but I didn't add a contrasting bottom as I wanted to use as much of my qayg panels as I could. I'm happy to say the pouch turned out even better than I imagined. I love, love, love this combination of scrappy patchwork and metal zipper beautifully framed by zipper binding. I think it makes a perfect new home for my pens and markers. In case you'd like to make your own qayg Lola, you can purchase pattern here. 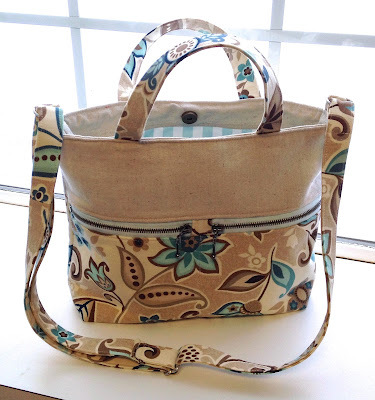 I'm super excited to see so many of you branching out and giving bag making a try. How absolutely, totally wonderful! 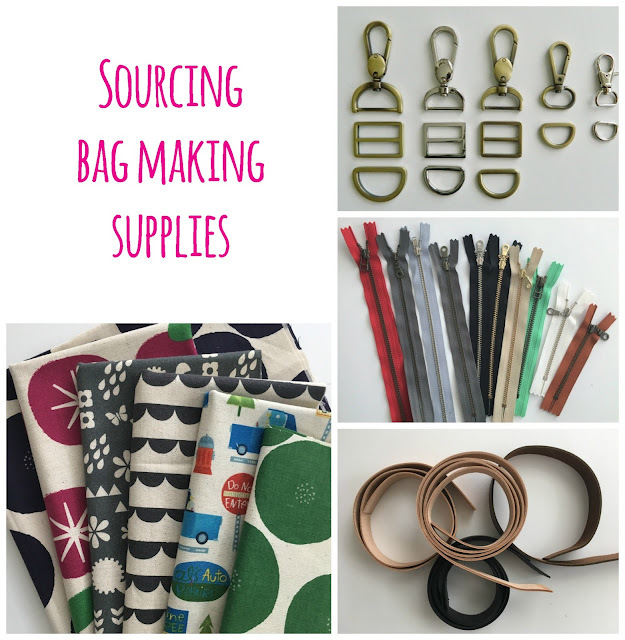 To help you on your journey, and to answer many, many questions coming to me through your emails, I decided to put together a list of my very favorite bag making supplies and where I buy them from. I hope you'll find this a useful resource. I'm not affiliated with any of the suppliers I list in here and I do not get any compensation for writing this post. I've been buying from these suppliers for quite some time and I love not just their products, but also their friendly and speedy service. I love using regular quilting cotton, of course, as it comes in so many different colors and stunning prints. Lately though I've been quite enjoying working with linen and linen/cotton blends. It's thicker and a bit heavier than quilting cotton and I think it's just the right weight for bag making. My go to store for printed linen is Miss Matatabi on etsy. I also use lots of duck canvas either as linings for my bags or as the interlining fabric to make the bags hold their shape better. I buy all my canvas at Joann store. SF101 - medium weight fusible interfacing is the one I use the most. I also like using 987F fusible fleece when I want my finished bag or pouch to have a squishier finish. I also quite like using ByAnnie's Soft and Stable or Pellon Flex Foam if I want my finished bags to be extra sturdy and holding their shapes really well. I love, love, love metal zippers and I usually keep an array of different sizes and colors on hand. I buy all my zipper from zipit on Etsy. I have only recently started adding leather straps and handles to my bags and I'm completely smitten as they add such a fabulous touch of luxury and finesse to any finished product. I buy either 3/4" or 1" wide straps in longest length available and cut them to needed size with my rotary cutter. I buy my leather straps from Leather EU on etsy or from Anna (noodlehead) 's store. I've been using waxed canvas for about a year now and I'm madly in love with this material. It's sturdy, waterproof, and fabulously rugged looking. And, just like leather handles, it looks better the more you use it which is absolutely perfect for bag making. I buy my waxed canvas from A. L. Frances on etsy. I really hope you find this list helpful. Where do you buy your bag making supplies? Please post links to your favorite shops in comments section below. 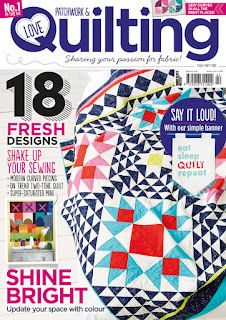 I'm quite excited to show you my HRT quilt featured in issue 42 of Love Patchwork and Quilting magazine. 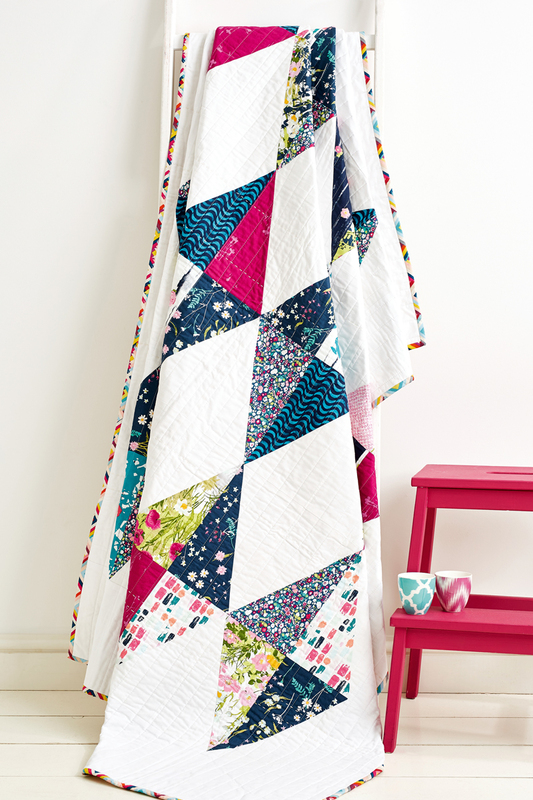 I love the graphic boldness of this quilt as well as the simplicity of its construction which makes it a perfect introduction to working with half rectangle triangles. Plus, it's a great quilt to show off some of your very favorite prints. I chose Lavish by Katarina Roccella in combination with Kona white and I absolutely love how bright, happy, and fresh looking this quilt turned out. And, as always, LPQ magazine did a fabulous job styling and photographing the quilt. I love large scale piecing and I greatly enjoyed designing and making this quilt. When it came to quilting it, I decided to go with my all time favorite straight line quilting (lines are about 1 1/4" apart). I also added a few random horizontal lines of hand quilting using sashiko thread. The quilt finished at 57" x 76". 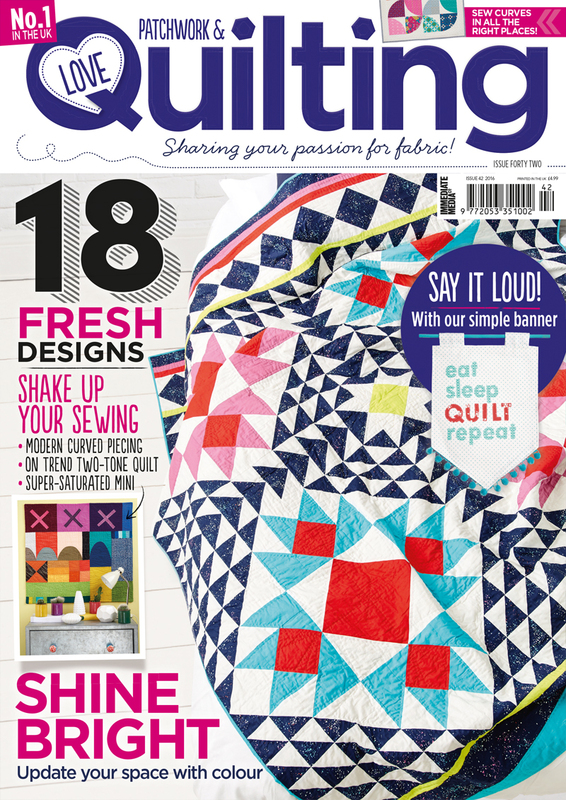 And, as I already mentioned, the quilt is featured in issue 42 of Love Patchwork and Quilting magazine and is now available for sale in the US. I'm excited to introduce my newest pdf pattern to you today. Sylvie Tote is a quick, easy to customize pattern and comes in three sizes so you can make a tote to fit your every need. Small tote is 10 ½” wide x 13” tall x 2 ½” deep and is a perfect fit for a smaller project and a few books or notebooks. Everyday tote is 12 ½” wide x 14 ½” tall x 3 ½” deep and, as a name suggests, is a perfect everyday tote bag. I love this tote and use mine all the time. I also love the addition of longer straps as the tote can be carried over a shoulder. And then there's the chunky sized tote :). It's 11” wide x 13” tall x 8” deep and I absolutely love how much stuff I can fit into this tote. I think this will be a great tote to carry my larger projects around. What do you say? Ready to make some totes? 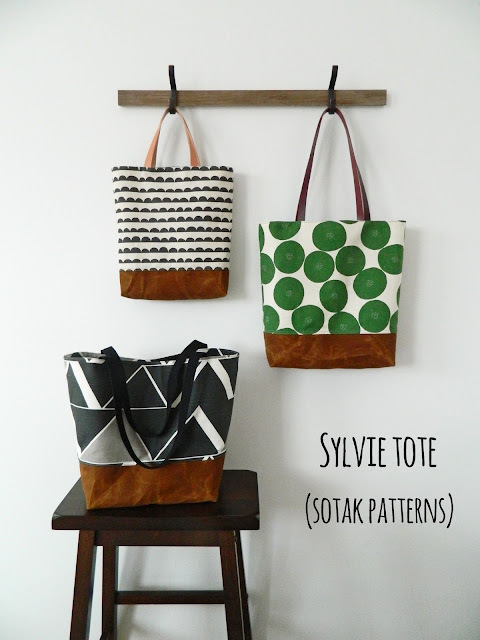 Sylvie Tote pattern is now available for sale at my etsy shop or you can purchase it directly by clicking on the button below. Hello friends, how are things? Is 2017 treating you well so far? I do hope it's off to a good start. My goal for this new year is to be more focused, especially when it comes to sewing and creating, as I tend to get excited about way too many different projects and forget to work on what really needs to be done. One of the main things I really, really want to focus on this year is publishing more pdf patterns. I love coming up with new designs, working out the steps, and most of all seeing others create with my patterns. And so it's been all about bags all the time lately. So fun, I tell you. As you can probably tell I'm quite obsessed with waxed canvas + linen + leather handles combo. I think it makes for the best totes ever!!! I've also been doing a bit of sketchbook drawing to try out some new ideas for screen printed fabric. These poppies are my favorite right now. I hope to make the sketch into a screen soon so I can give it a go. What are your plans for this new year? Any fun projects or goals? Do tell.